Welcome to our newly "Nautically Decorated" store! We are located at Lighthouse Marina just off the main dock. 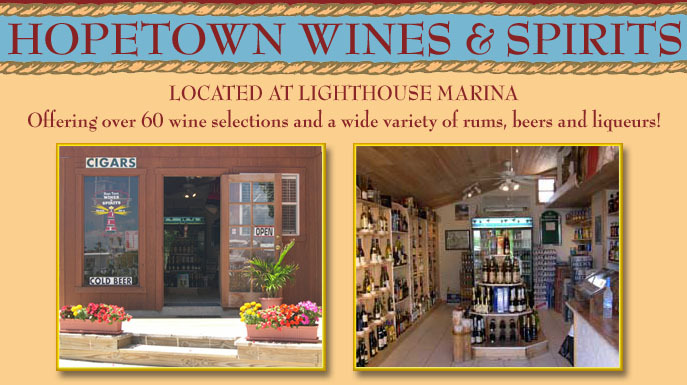 Offering over 60 selections of wines, a wide variety of rums, spirits, liqueurs & beer. Now available, "Bahiba Cigars" and tobacco items. NEW! Online Ordering System - click here! Call your order in at (242) 366-0525, VHF 16 or email us. for you to enjoy on your next vacation. maintenance, repairs, ice, bait, tackle. Copyright © 2017, Hopetown Wines & Spirits. All rights reserved.